Happy Easter, everyone! Have a safe and happy holiday! 20 hours 27 min ago. Happy Feature Friday, everyone! Say hello to Raluca Gheorghiu Boac, an alumni of our Graduate Program and a Romanian-born pianist who loves to share Romanian piano music with Minnesota! 2 days 19 hours ago. Congratulations to our current horn professor, Mike Alexander, on being named the Principal Horn Player of the Minnesota Opera Orchestra! 3 days 17 hours ago. See what Holly Brown has to say about St. Thomas Music! 5 days 19 hours ago. Congratulations to Dr. Bryan and Dr. Kachian on their years of dedicated service to the University of St. Thomas Music Department! Next time you see them, make sure to congratulate them and thank them for their years of service! 6 days 17 hours ago. The University of St. Thomas Symphonic Wind Ensemble, under the direction of Matthew George, continues to bring about some of the greatest literature for the wind band genre through their massive commissioning series. 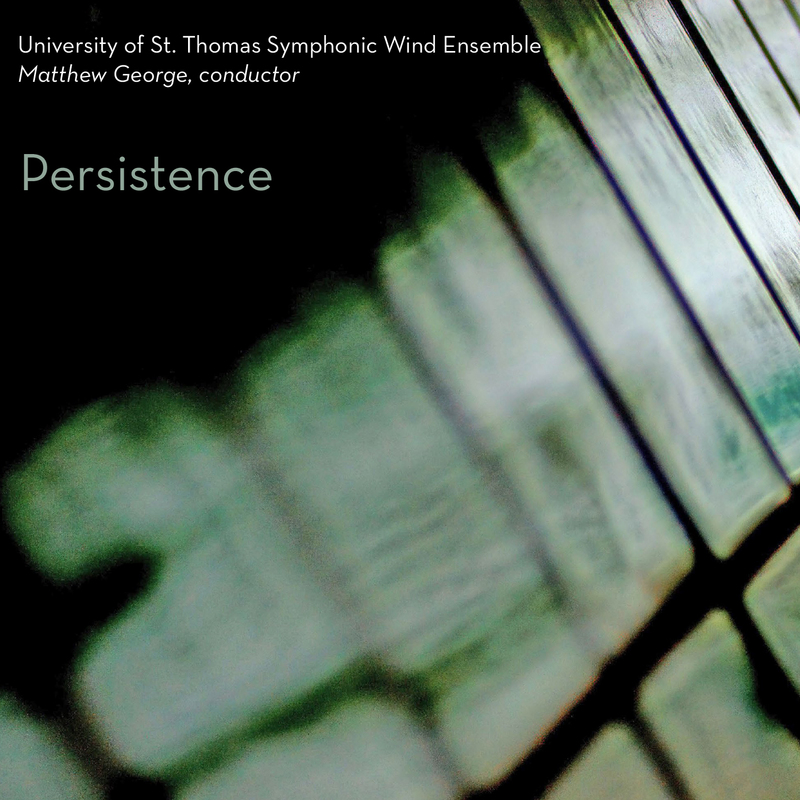 Now having generated over eighty new works for wind band, this pioneering ensemble continues it recording project with Persistence – a 3-CD set (Vols. IV - VI of the University of St. Thomas Commission Series including How Very Close, Love and Hope, and Duende) of works from around the world. How Very Close: Volume IV starts with a lively and optimistic “December Dance” by Andrew Boysen, Jr.. Also well known to the ensemble is Australian composer, Ralph Hultgren, whose piece “Concertino for Wind Ensemble” is a three-movement tour de force. The title track comes from highly acclaimed composer Dana Wilson. His six-movement song cycle employs poems on love written by some of the greatest poets of all time. “Mata Hari – Three Symphonic Scenes” by British composer Nigel Clarke explores the life of the infamous spy and seductress of the early 20th century. Volume IV ends with a nod to India, “Desi Jhalak” by the award winning Bollywood composer, Shamir Tandon. Love and Hope: Volume V features two works that explore life’s trials and tribulations as well as the triumph of human will and spirit. “Suite No. 4 for Band – Sinú” was written by Colombian composer Victoriano Valencia Rincón. This work chronicles the life of the prehistoric indigenous people inhabiting the region along the Sinú river and the subsequent Spanish invasion of the Conquistadors and later the African slave trade. Following this is the monumental work, “Lights from the Yellow Star: Music of Sorrow and Love.” Written by the award-winning Israeli composer, Boris Pigovat, this work is based on one man’s struggle through Nazi concentration camps and the brutal regimes of Hungary in the 1950s. Even in these inhumane circumstances, he is able to find humanity. Duende: Volume VI is influenced by the music and culture of Spain. The title track of the CD was written by the exciting young Spanish composer, Luis Serrano Alarcón. The term “duende” is often used in Flamenco to describe a state of inspiration and supreme, almost magical, perceptiveness. The jazz-influenced “Oneiric Discourse” is a virtuosic concertante for tenor saxophone and wind ensemble, composed by the Spanish soloist appearing on this recording, Jesús Santandreu. Finally, Aldo Forte’s “Dalí” is five-movement musical exposé based on some of the most well-known art works of the eccentric and masterful Spanish artist, Salvador Dalí. "This 3-disc collection offers ten of those pieces, most of them only a few years old. Andrew Boysen’s cheerful, 8-minute December Dance (2005) is the lively opener. Ralph Hultgren’s 3-movement, 12-minute Wind Ensemble Concertino (2011) is fierce in I (‘Con Forza’), calm in a low-register flute-solo II (‘Semplice’), the alternately fierce and joyous in III. Nigel Clarke’s Mata Hari (2002) presents “three speculative scenes from her life” : exotic ‘Dancer in the Shadows’,World War I spy 9(Deceit and Seduction’), and eventual ‘evasion and Capture’. The work ends by portraying her defiance in the face of a firing squad. Two of the works have soprano soloists Carrie Henneman Shaw is heard in Dana Wilson’s How Very Close (2013), settings of six poems that deal with love at its most intense. The texts (included) are by disparate poets: Sappho (5th-Century BC Greek), Rumi (13th-Century Persian), Emily Dickinson, and so on. Ms Shaw’s consonants are not always audible (her diction is clear at solo moments but often obscured when accompanied), and her expressiveness often seems suppressed, but her voice is lovely and pure-often sounding like a solo instrument. Casy Barker is the wordless soloist in the program’s biggest piece, Boris Pigovat’s 5-movement, 41-minute Lights from the Yellow Star: Music of Sorrow and Love (2011). The piece is about Robert Fisch, who survived Holocaust concentration camps and the Soviet crushed 1956 Hungarian Revolution, then moved to the US, and became an artist and physician in the Minneapolis area. The Introduction is portentous and beautiful. ‘When the Stones Weep’ is first brutal, then lovely and mournful in solos by bass clarinet, contrabass clarinet and flute. ‘1956’ begins as a happy march that turns ugly. ‘Silent Music’ and ‘Song of Love and HOpe’ present many challenges to instrumental soloists and sections, and except for occasional lapses of tone or intonation, these young musicians pass the tests. Luis Serrano Alarcon’s evocative Duende (2010) has become a wind ensemble favorite (two recordings are reviewed in J/F 2016:213). Composer Jesus Santandreu is tenor saxophone soloist in his own Oneiric Discourse (2011), a 20-minute excursion into jazz-based harmonies and gestures. He is a fine player with warm tone and the ability to shift easily from standard to extended playing techniques; and his musical ideas are interesting. So are the ideas in Aldo Raphael Forte’s 17-minute Dali (2003), the last piece on this three-hour program, where each of the five movements depicts an artwork by the Spanish surrealist. A few of the pieces didn’t do much for me. In Shamir Tandon’s 11-minute Desi Jhalak (2012) the Indian flavors and musical ideas seem shallow -or at least they seem odd as played by a Western concert band. Victoriano Valencia Rincon’s Sinu (Origenes) (2012) tells the sad tale of the Zenues, a South American people who fell to the invading Spanish in the 16th century. Here my response seems tied to the performance, at least as much as to the actual music. When the playing is quiet- when tone qualities and intonation are unsure-the music itself seems rather mediocre. But when the playing is animated or intense, the music seems most interesting. This university band and its director Matthew george deserve praise for bringing a very large project to fruition."